We’ve made some changes this year that affect what you will receive in the postal mail. Please read the following information carefully and be certain to read about pool guest pass distribution below. Annual meeting materials were mailed from the post office today (Wednesday, April 5). Watch your mail for a letter sized envelope containing the Notice of Annual Meeting, candidate biographies and voting ballot for Board of Directors (sent to all households with no outstanding deed violations or delinquencies). Pool guest passes are NOT included in this envelope. Keep reading below. A large 9x12 envelope was mailed in prior years. This year, the envelope will be regular letter-size. It may look like junk mail, but it isn’t. Do not discard this envelope! It contains your household’s voting ballot. Lost, discarded or misplaced ballots will not be replaced. Completed paper ballots may be mailed or brought to the office. They must arrive at the Association office no later than 12 noon on Wednesday, April 19, 2017 in order to be counted. Alternately, completed ballots may be brought to the annual meeting. Links to the 2016 annual meeting minutes and 2016 audited financial statement are on the Annual Meeting page in the Members Area. The pool and tennis activity sheets can be found in the regular area of the site. If you are unable to access any materials, please call the office at 614-889-0922. For those residents on electronic communications, watch your email today (April 5) for a link to you ballot. Please vote! Candidate biographies can be found online. Review them before starting the voting process. Since each household may only vote one time, only ONE EMAIL will be sent to the PRIMARY email address you provided for your household. Ballots are only sent to those households in good standing (no outstanding deed violations or delinquencies). The email will be sent from an address similar to "[email protected] via surveymonkey.com". The title of the email will be "Voting Ballot from Muirfield Association”. The email will contain directions and a link to your ballot. Do not forward this email to another address. Just as with paper ballots, each household is entitled to one vote, so the link in the email will only work one time. Please confer with other members of your household before voting. Once the ballot is cast, it cannot be changed. Watch your email and spam carefully. Individual ballots cannot be resent, just as paper ballots cannot be re-mailed. If you do not receive your email by April 6, check your spam. If you are not able to locate the email, please email [email protected]. Providing your name and Muirfield street address will expedite your inquiry. Electronic voting will close automatically at 12 noon on Wednesday, April 19, 2017. You mustvote by that time in order for your ballot to be counted! You may either pick up guest passes at the Association office during regular business hours at any time of the year or at either pool during regular pool hours at any time in the season. Each household is entitled to 15 pool guest passes per calendar year. Passes may only be picked up for the current year. All 15 passes will be issued at the same time. Only an adult resident of the household (18 years or older) may pick up passes. Children 17 and under, relatives, guests, friends, nannies or any others cannot pick up passes. Residents may only pick up guest passes for their own household. A Muirfield photo ID is required to pick up passes at the pool. The resident picking up passes must sign for them. All transactions will be recorded. Passes may be used immediately if desired. Lost, stolen or discarded passes will not be replaced. Did you know? Guest passes from any previous year may be used at the pools, even if they have a specific year printed on them. Do not throw out your old passes! If you run out of passes, you can still bring guests to the pool by paying $2 per person, per visit. Please remember that only members in good standing (no outstanding deed violations or delinquencies) may use the pools. Residents who are not in good standing may still pick up their guest passes, but will not be able to use the facilities until they are in good standing. Guests must always go to the pool with a resident. The MVCA Annual Easter Egg Hunt is this Saturday, April 8, 2017, 2:00 p.m. at the Holbrook Recreation Area. This is open to all Muirfield Residents and their families. It's free and there's no need to register – just show up! 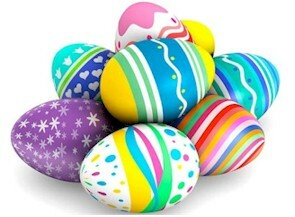 Please be sure to arrive on time since eggs will be picked up quickly by participants. The rain date is Sunday, April 9 at 2:00 p.m. Contact Mindy Miller at 614.565.7737 or Ray DiRossi at 614.578.3848 with any questions. See you there!